These sweet-salty bewitchin' cookies are easy to make and fun to eat! They will even work for an adult Halloween Party. Your guests will love these tasty snacks. 1. Heat oven to 350 degrees F (180 C). Mix brown sugar, butter, water and vanilla in medium bowl. Stir in flour and salt. Shape dough into twenty 1 1/4-inch balls. 2. Place pretzel rod halves on ungreased cookie sheet. Press ball of dough onto cut end of each pretzel rod. Press dough with fork to resemble "bristles" of broom. 3. Bake about 12 minutes or until set but not brown. Remove from cookie sheet. Cool completely on wire rack, about 30 minutes. 4. Cover cookie sheet with waxed paper. Place brooms on waxed paper. Heat shortening and chocolate chips over low heat, stirring occasionally, until melted and smooth; remove from heat. 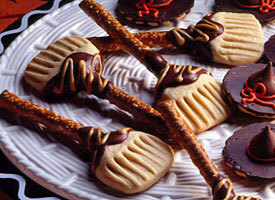 Spoon melted chocolate over brooms, leaving about 1 inch at top of pretzel handle and bottom halves of cookie bristles uncovered. Drizzle with melted butterscotch chips. Let stand until chocolate is set. In my very innocent thought, I think that the whole part except the cookie part was brilliant! I kindly suggest that the cookie part would be made out of peanut butter cookies instead. (other than the cookie) I LOVED YOUR RECEPIE!!! Cheerio! Awesome idea, but mine did not come out looking anywhere near as cute as the picture. The cookies spread so much that it was impossible to tell what they are! However, while they were still warm, I shaped the broom part into a rough square, and I am going to pipe bristles onto them and pray that they look decent. I don't want to throw them out! I wonder if they spread so much because I used packaged cookie dough? Love the idea but these are deceptively difficult - for me! It didn't help that I probably started with the worlds most complicated Peanut Butter Cookie recipe. I think the dough suggested above may have been easier to mold, though less tasty. I kind of got the hang of it after the first batch, but they look NOWHERE near as cute as the picture. I'm hoping that practice makes perfect. © 2019 Diana Baker Woodall. All rights reserved.